'When the Wind Blows' by Raymond Briggs. This demo by The Waterfront, featuring a whistling solo, was inspired by the 1982 graphic novel of this title by Raymond Briggs. The novel tells the story of a nuclear attack on Britain by the Soviet Union, from the viewpoint of a retired couple, Jim and Hilda Bloggs. One afternoon, the couple hear a message on the radio, warning of "outbreak of hostilities" in three day's time. Jim immediately starts construction of a fallout shelter, while the two reminisce about the Second World War. They just make it into their shelter before a nuclear explosion, and stay in it for several days; misreading the advice given in governmental leaflets, they believe they have to stay in the shelter for fourteen days instead of two. They do briefly venture outside to get some fresh air and rainwater, exposing themselves to a large amount of radioactive fallout. 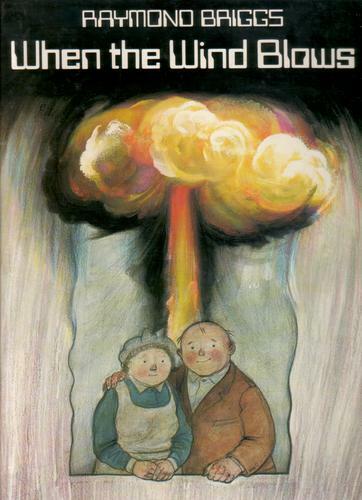 Jim and Hilda exhibit considerable confusion regarding the serious nature of what has happened after the nuclear attack; this generates gentle comedy as well as darker elements. As the novel progresses, their situation becomes steadily more hopeless as they begin to suffer the effects of radiation sickness. Hilda suffers the most, losing her hair, vomiting and has bleeding gums. The novel ends on a bleak note, with both praying in their fallout shelter as death approaches. In 1986, the book was made into an animated film, with David Bowie providing the title track.